Soft surfaces have traditionally been one of the bigger challenges to sanitize in the healthcare environment. One study found that 92 percent of privacy curtains have been found contaminated with infectious bacteria within one week of laundering.Yet another study cites that as much as 60 percent of nursing and physician attire can be a source of nosocomial infections. 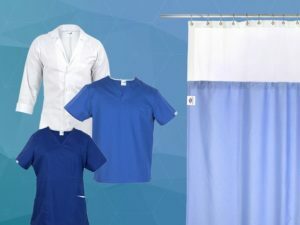 Now, Prime Medical, in partnership with Clorox Professional Products Company, is introducing hospital privacy curtains, scrubs and lab coats that harness the sanitizing effects of sodium hypochlorite-based bleach to help make these soft surfaces part of the solution in reducing healthcare-associated infections (HAIs). The new Prime Medical privacy curtains, scrubs and lab coats will feature the Clorox Healthcare and CloroxPro-brand equities and provide unprecedented bactericidal protection, leading to safer patient environments. The fabric works by enabling bacteria-fighting molecules to bind to the fabric’s surface for up to 12 weeks after washing with bleach, inhibiting the growth and spread of viruses. The fabric recharges during each washing, and the antimicrobial capability is durable for a minimum of 75 industrial washes. When laundered per the label instructions with the EPA-registered bleach, lab tests have shown the activated fabric can kill bacteria and viruses with 99.9 percent effectiveness, according to a study by the fabric’s manufacturer. This means that as health care providers move between patient rooms, they can reduce the risk of spreading unseen pathogens via their scrubs and lab coats. And, for privacy curtains that are often touched and rarely changed, the fabric’s antimicrobial capability provides an additional layer of protection to prevent the spread of bacteria and viruses. The privacy curtains are a two-part system consisting of a 6-foot modular privacy panel that easily snaps onto a mesh top. Each privacy panel weighs just 1.4 pounds, making it easy for one person to change a curtain in as little as 40 seconds without a ladder. The fabric on all three products is fade-resistant to bleach so they will retain their original color wash after wash. The Clorox Healthcare privacy curtains will be available December 2018 and the CloroxPro scrubs and lab coats February 2019. For more information about the new products, visit www.primemedical.com. Laboratory conditions using AATCC 100 test method.